Celebration of Teaching & Learning: Where Knowledge Meets Inspiration. 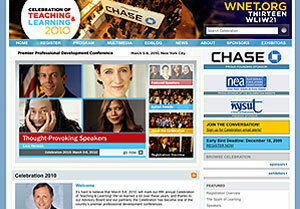 Join education colleagues from across the nation at the 5th Annual Celebration of Teaching & Learning on March 5-6, 2010. Gathering in New York City, educators and administrators will be able to connect with global experts, activists, academics and thinkers including U.S. Secretary of Education Arne Duncan, Her Majesty Queen Noor, Lisa Henson, Queen Latifah, Bobby McFerrin, Steve Spangler, David Rose, Linda Darling-Hammond, Diane Ravitch, Nancie Atwell, Alan Blankstein and others to share the best in education practice. For more information, visit www.thirteencelebration.org. 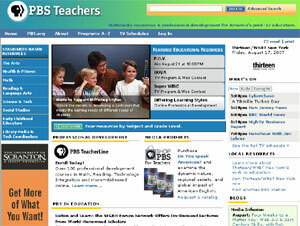 PBS TeacherLine is the premier online professional development resource for Pre-K-12 teachers. 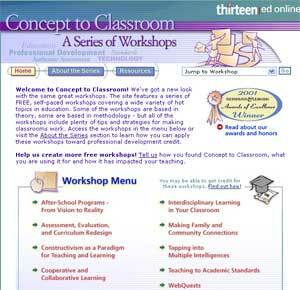 The site contains over 100 professional development courses in Math, Reading, Technology Integration and more. Fall courses are now enrolling. Take any PBS TeacherLine course and earn graduate credits. Launching this fall, PBS TeacherLine Peer Connection is a professional development tool that combines the power of online communication and collaboration with trusted, valuable content to provide a rich, flexible set of tools for instructional coaches. The National Teacher Training Institute (NTTI) provides teachers with the vision, strategies, and resources they need to make dynamic use of classroom technology. While many school districts have invested in computers, modems, and video equipment, too few offer teachers the support and training they need to use these tools well. 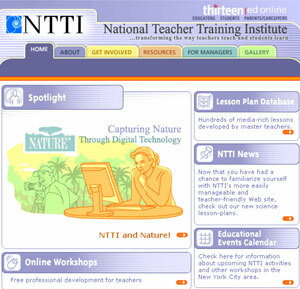 Through NTTI, teachers train teachers to use emerging technologies. Though inherently a professional development program aimed at serving educators, NTTI's ultimate beneficiaries are the millions of students these teachers inspire. Teachers, administrators, librarians, or anyone interested in education will find these workshops priceless -- and there's no technical expertise required. Covering a wide variety of hot topics in education from theory to methodology, all of the workshops include tips, videos, and strategies for making classrooms work. Apply these workshops toward your professional development. 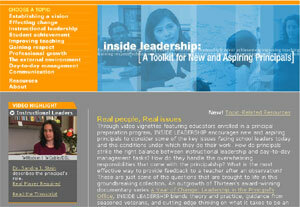 Through video vignettes featuring educators enrolled in a principal preparation program, INSIDE LEADERSHIP encourages new and aspiring principals to consider some of the key issues facing school leaders today and the conditions under which they do their work. How do principals strike the right balance between instructional leadership and day-to-day management tasks? How do they handle the overwhelming responsibilities that come with the principalship? What is the most effective way to provide feedback to a teacher after an observation? These are just some of the questions that are brought to life in this groundbreaking collection. An outgrowth of Thirteen's award-winning documentary series A Year of Change: Leadership in the Principal's Office, INSIDE LEADERSHIP blends theory and practice, guidance from seasoned veterans, and cutting edge thinking on what it takes to be an effective and successful school leader.